Restaurant for Lease: Turn Key. Just Move in. FREE RESTAURANT! That's right, no joke, own this beautiful location, including ALL equipment! EVERYTHING IS INCLUDED! All equipment is just over 2 years old. This location is currently closed. That's not all! The landlord has reduced the base rent to an unheard of 50 cents per square foot! This is the most beautiful buffet restaurant in the high desert. Keep it as is, or change to YOUR concept. This could be a steak house, a night club, etc. Just bring your concept. There are no restrictions from the landlord on this location!!! The previous owner's loss is your gain. Over $600,000 invested, and well over $250,000 in equipment. Just sign a new lease with unbelievable terms and get started today! Landlord is looking for good credit, working capital, and some restaurant experience. 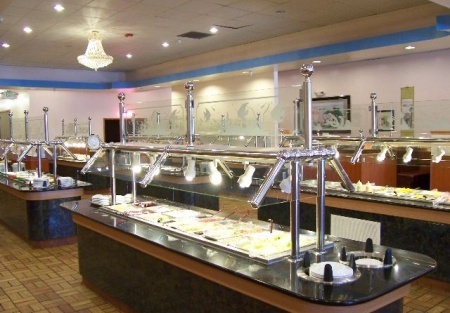 Located in a very nice strip mall, with great visibility this restaurant features 8,000 square feet of space. You must take a look at this to appreciate the opportunity. Act now or lose out on this gem. Please click on one of the orange buttons below to take the next step towards your financial independence! Extremely Popular With the Locals!